With the aim of strengthening awareness of sustainable tourism in destinations around the world, the GSTC Sustainable Tourism Training Program (STTP) covers global trends in sustainable tourism and sustainability best practices for businesses and destinations, and offers a unique opportunity to gain an in-depth understanding of the GSTC Criteria, the global baseline standards for sustainability in travel and tourism. Guide various sustainable business practices, from product development to supply chain management. Assist sustainability training and skills development efforts, helping improve employee sustainability performance. Communicate to customers and to the media about sustainable business practices more effectively. A tool for destination leaders and industry stakeholders to properly understand relevant sustainability issues and practices. A baseline standard to assist the development of regulatory and legal frameworks for national, provincial, or local standards. Guidelines to support the process of becoming certified as a destination by a GSTC-accredited standard. The STTP is supported by and delivered in partnership with TrainingAid. The objectives of the STTP are particularly relevant this year, given the context of the United Nations International Year of Sustainable Tourism for Development (IY2017), which has given the global tourism industry important impetus to focus on and highlight how travel can make a positive impact on communities and destinations around the world. Specifically, through the STTP, the GSTC has contributed to the “capacity-building and education” goals of IY2017, implementing the recommended activities such as “run capacity-building workshops / trainings on sustainable tourism” and “advance education in sustainable tourism and its contribution to development”. The GSTC also contributes to the goals of the 10-Year Framework Programme on Sustainable Consumption and Production (10YFP), with the STTP as part of the 10YFP Portfolio, relating to the Action 3.1.2.d. (“Provide training to destination managers and key stakeholders on sustainability principles based on the GSTC Destination Criteria”) under the Work Area 3 (“Fostering the application of guidelines, tools and technical solutions to improve, mitigate and prevent tourism impacts and to mainstream SCP patterns among tourism stakeholders”). In 2017, we took an important step to expand the reach of STTP; adding online training class options, which has allowed for more participants, including those in locations where onsite training classes are not yet available, to take advantage of the training opportunity. 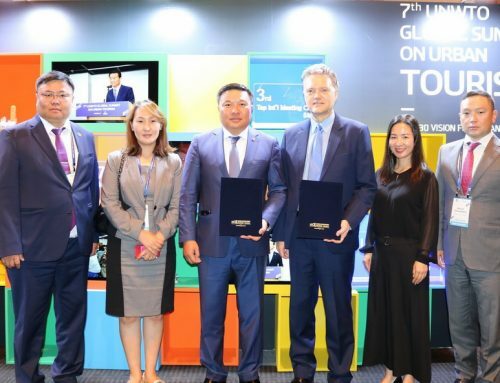 In addition, we’ve offered need-based discounts, granting significantly discounted access to the training program for those who demonstrate genuine need, for example, tourism professionals from Least Developed Countries. As part of the GSTC’s efforts to support and contribute to the goals of IY2017, the STTP kick-started the year with the goal of training 300 industry professionals in sustainable tourism standards, helping them implement sustainability best practices within their own companies and destinations. We are proud to share that working with our international team of trainers and partners, we have met and exceeded this goal. 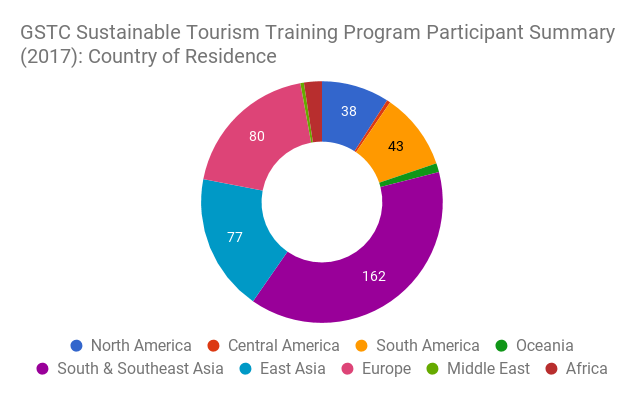 Throughout the year, the STTP offered 18 training sessions (3 online courses and 15 face-to-face classes) around the world, attended by a total of over 400 tourism industry professionals from 54 countries. Through the STTP, the GSTC has engaged many national governments and tourism bodies in the development of sustainable tourism destination strategies and practices, including just a few of the examples below. In January 2017, the GSTC, in collaboration with the Ministry of Information, Culture and Tourism (MICT) of Lao PDR and GIZ (German Corporation for International Cooperation), conducted a sustainable tourism training class in Vientiane. The training class was attended by MICT officials and destination representatives from 17 provinces, researchers and educators, and tourism and development experts from international organizations including GIZ, Swisscontact and the Asian Development Bank. As a result of this training and the GSTC’s continued partnership with participating organizations, plans for further work supporting the sustainable development of destinations (both at the municipality and regional levels) in Lao PRD and in southeast Asia are underway. Recognizing the importance of the sustainable development of tourism and hospitality in Myanmar, where tourism is experiencing rapid growth, the GSTC partnered with Swisscontact and the Myanmar Responsible Tourism Institute (MRTI) to organize the first-ever “Forum on Sustainability in Tourism and Hospitality in Myanmar” in Yangon, Myanmar in March 2017. H.E. Mr. Paul Seger, Ambassador of the Embassy of Switzerland in Myanmar as well as U Ohn Myint, Deputy Director General, Directorate of Hotels and Tourism (MoHT) participated in the Forum and delivered remarks to highlight the importance of the event in promoting sustainable practices in Myanmar. The GSTC continues to engage with partner organizations working with tourism stakeholders in Myanmar, in order to support continued development of sustainable tourism in the country. Following the GSTC training session in 2015, the Ministry of Tourism of Indonesia has worked with the GSTC in the development of sustainable tourism policies and practices in Indonesia. In 2016, the Sustainable Tourism Destination Standard for Indonesia has achieved the “GSTC-Recognized” status, affirming Indonesia’s commitment to promote sustainable tourism products and services across the nation. This year, the Ministry continued its collaboration with the GSTC, offering the first “Emerging Destinations Workshop” in November 2017, with the aims of helping managers of emerging tourism destinations strengthen their sustainable development efforts, and creating stronger market linkages between the destinations and sellers of travel products. We are keeping up the momentum we’ve achieved in 2017, and continuing with a year-round calendar of online and face-to-face training classes around the world. We are also looking to diversify learning opportunities, e.g. focusing more deeply on specific topics and issues, offering tailored group training options, and exploring training formats that best support our goals. So, whether you were part of the STTP in 2017 or earlier, or you’re interested in joining one of our training classes in 2018, we want to hear from you. Please feel free to get in touch to share your ideas and suggestions, so we can work together with you to improve our training program in 2018. Email: training [at] gstcouncil.org and follow our social media updates with #GSTCtraining!